On the Road: Keeping Hydrated. Just. When I go to music festivals I have a raft of strategies to ensure that I visit the toilets as few times as possible but also avoid dehydration headaches. On this trip it’s been a similar balancing act but for different reasons. The toilets here haven’t been all that bad – sometimes they don’t flush, often there’s no toilet paper but they’re still a lot better than port-a-loos at the Big Day Out. The only thing that makes me wince is when the floor is covered with (what I hope is) water and I’m wearing sandals. There was one where there was no running water and the floor was wet. I was wearing sandals and my feet got wet. Urgh*. Squat toilets are fine although (and please don’t tell anyone) I’m still not 100% sure which way I’m supposed to face. Towards the cistern (if there is one) or the door? Does it even matter? No, the toilets are not the issue here, it’s getting on the truck and then not having a toilet stop for several hours – when we drove into Nairobi the traffic ground to a halt and the promised toilet stop ended up being over an hour further on than intended. A bucket in the stairwell was the solution. On one game drive it was about 5 hours between toilet stops and we’re not allowed to get out of the vehicle in case of lions. Although this issue pales in comparison to the stay-in-you-tent-or-get-eaten-alive threats of wild camping. Several times we’ve camped in national parks and been told that if we need to go to the toilet we should first listen. If there are noises outside do not turn on your torch, make a noise or look outside. If you do not hear a noise shine your torch out. If you see eyes reflected back do not go out. If you do not see eyes go in pairs to the toilet. Keep your tent zipped up at all times. Steve told us a story about a young man who, on a hot night, refused to zip up his tent. He woke up with a lioness biting his foot. He kicked her then bolted out of his tent into a pride of lions and was ripped apart then eaten. There have been other stories about one of the cooks being eaten, rangers being eaten… as you can imagine, we all try our very hardest to not drink too much in the evenings and we avoid leaving our tents. So far I’ve only once needed to get up in the night and that was in a town camp. Pretty good for someone who normally gets up several times. Apparently fear works on my bladder as well as my brain. All the stories aren’t scary though. Our cook, Mash, told me one about a friend of his who, knowing baboons are scared of snakes, got a loaf of bread, hollowed it out and put a rubber snake inside. He threw it to a group of baboons. They grabbed it, ripped it apart and when they saw the snake they all fainted. * let me reassure you that we are all quite diligent in spraying our hands with disinfectant when we get onto the truck and before meals. I promise. « Uganda: On The Road. NOTE TO SELF…. Outback camping in Africa is definately off your bucket list! The unfortunate reality for a diabetic is frequent urination, particularly after drinking in the evening!!! I would have to pee all inside the tent and the scent would probably attract them any way!! Yeah, that would certainly be a problem! However you could do Africa in much better style than we have and ditch the tents;). The scent doesn’t attract animals but apparently toiletries can’t be left in tents because they smell like food. 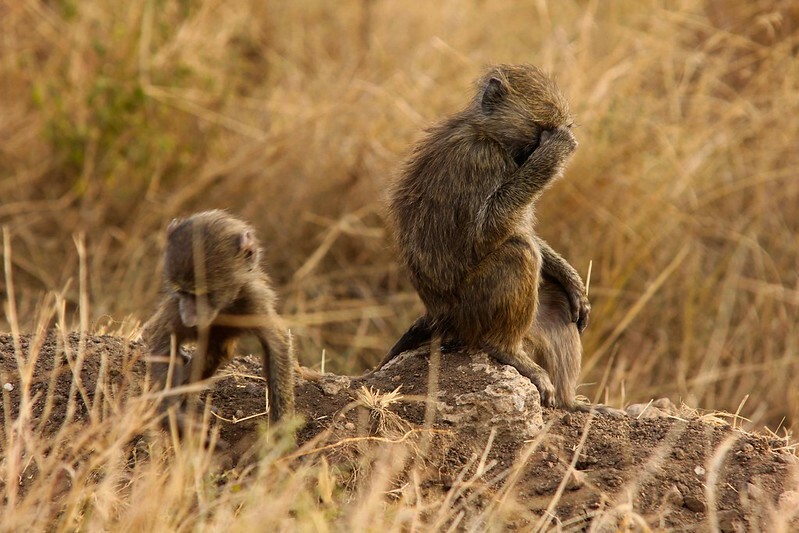 We’ve heard so many stories of tents getting trashed by baboons or trampled by other animals. It’s quite daunting!